Contrary to the Indian and western media hype about Modi-nomics, it was recently reported that unemployment rate in India has reached its highest in 45 years. Indian GDP growth figures have been challenged as too optimistic by top Indian and western economists. Modi's demonetization has turned out to be a major disaster for India's largely cash-based economy. Farmers are continuing to take their own lives by the thousands each year as the agrarian crisis continues to take its toll. 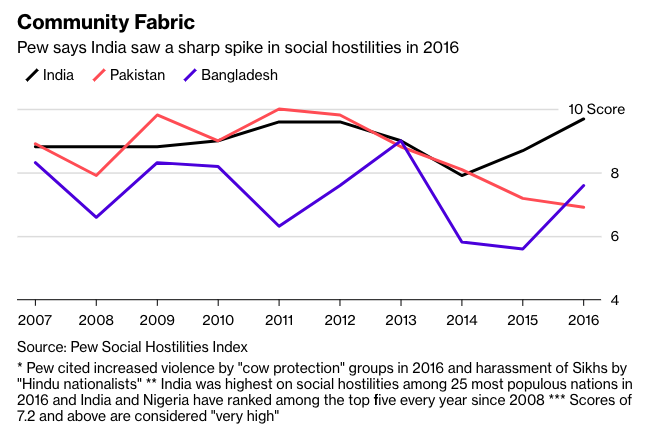 India's community fabric has been fraying with sharp spike in social hostilities against minorities. This year's United Nations Sustainable Development Solutions Network's annual World Happiness Report ranked 156 countries based on 6 indicators: income per capita, life expectancy, social support, freedom, generosity and corruption. Countries in Scandinavia continue to to top the list while Sub-Saharan African nations remain at the bottom. Pakistan ranks 67 among 156 countries, tops South Asia region. China ranks 93, Bhutan 95, Nepal 100, Iran 117, Bangladesh 125, Iraq 126, India 140 and Afghanistan at 154. Indian Prime Minister Modi has been accused by his critics of stoking tensions with Pakistan ahead of this year's general elections to divert attention from his government's poor performance. Some analysts believe that recent Indian airstrikes in Pakistan have helped bolster Modi's domestic support among his among his right-wing Hindu Nationalists base. While Modi may have made domestic political gains, India's international perception as a "great power rising" has suffered a serious setback as a result of its recent military failures against Pakistan. Pakistan spends only a sixth of India's military budget and ranks 17th in the world, far below India ranking 4th by globalfirepower.com. Is India a "Paper Elephant"? The World Happiness Report combines quantitative data -- such as per capita GDP growth -- and qualitative data, such as social support, freedom to make life choices, and perceptions of corruption , to rank 156 countries. 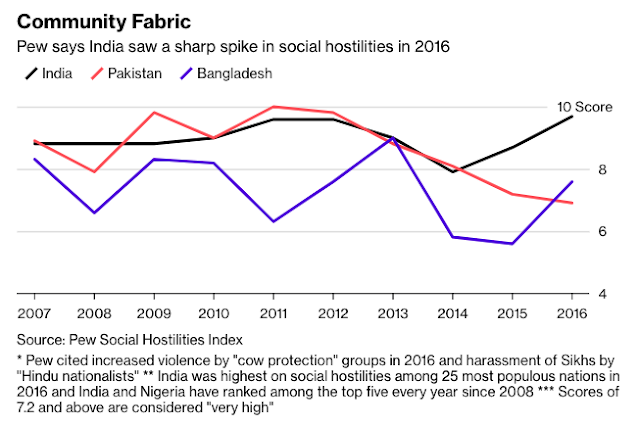 Pakistan's big edge in the happiness ranking over India may come as a surprise to some emerging market observers. India’s economy has been outperforming Pakistan’s in a number of metrics, like world competitiveness, GDP size and growth, and inflation rates - see table. Besides, India is a democracy that has yet to be interrupted by military coups. So, what have Pakistanis done better than Indians in the pursuit of happiness? It’s hard to say. Most of the variables included in the calculations are qualitative, and therefore, prone to specification and measurement errors. Still , the gap between the rankings of the two countries is too big to be ignored. Indeed, the rich are getting richer in India while the poor are getting poorer. Over the last four decades, India’s top 1% earners’ share of the country’s income rose from roughly 7% to 22%, as of 2014. Meanwhile, the income share of the bottom 50% earners declined from roughly 23% in the early 1980s to 15% in 2014. That’s according to 2018 World Inequality Report, which compiles data from the 1950s to 2014. Meanwhile, India’s income inequality is much higher than that of both Pakistan, and Bangladesh, as measured by the Gini coefficient of income inequality. That’s according to Standardized World Income Inequality data. Meanwhile, poverty rates are higher in India than they are in Pakistan and Bangladesh, according to World Bank. Then there’s “vulnerable employment”— employment in unpaid family activities—which is much higher in India than in Pakistan and Bangladesh. Wait, there’s more. There’s economic freedom. Published by the Heritage Foundation, the Economic Freedom report measures such things as trade freedom, business freedom, investment freedom, and the degree of property rights protection in 186 countries. Though the two countries have ranked closely in the last couple of years, Pakistan’s ranking has consistently beaten India's over longer periods. In fact, a closer look at the ranking components of the two countries reveals that Pakistan has fared better than India in the area of government spending, which matter a great deal when it comes to providing on welfare programs. It comes off as a true surprise when we witness Pakistan performing better than its neighbouring counterpart on the "World Happiness" forum. Quite imperatively, this better ranking could only have been achieved via much higher scores in nearly all social sectors encompassing the general population. Taking into acccount Pakistan's performance among the South Asian countries, it certainly runs better than the rest of the members, topping the happiness ratio. It becomes quite evident that despite being a much bigger economy and a global market niche, the Indian society just couldn't translate its better economic conditions into a happier, contended populace. One might argue that the Indian peninsula is vast in its land area as well as its population types and density distribution that have all combined to contribute to its lower-than-expected happiness figures. True enough, but then this assumption points to its another negative aspect --- the inequal distribution of resources and opportunities among its living classes of citizens. All in all, even a higher GDP growth, dollar reserves, military personnel and arsenal and a much larger world market, it is the global gauge now that is speaking lowly of its happiness extent. They need to buck up if they intend to lie any closer to us.